Two years ago, the Prado website was reaching the end of its useful life. Since its launch in 2007, it had become the reference and main access to Prado’s information for the general public. Prado’s most important asset is the Collection, and this was the axis of the new website project. The Collection would be the center. Besides, after several changes in the Internet paradigm, the Prado needed a new website with new features, including the basic checklist of a modern website: responsive design, markup language, greater integration with social networks, broadcasting multimedia content, etc. 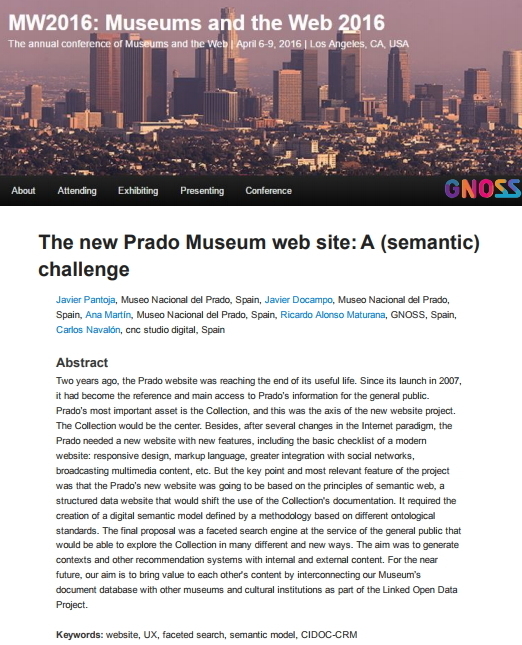 But the key point and most relevant feature of the project was that the Prado’s new website was going to be based on the principles of semantic web, a structured data website that would shift the use of the Collection's documentation. It required the creation of a digital semantic model defined by a methodology based on different ontological standards. The final proposal was a faceted search engine at the service of the general public that would be able to explore the Collection in many different and new ways. The aim was to generate contexts and other recommendation systems with internal and external content. For the near future, our aim is to bring value to each other's content by interconnecting our Museum’s document database with other museums and cultural institutions as part of the Linked Open Data Project.